What is advertising if you boil it down to its most core element? Some might say advertising is simply the process of promoting one’s self, an organization, a service or good, or an idea to provoke people to respond. Advertising may result in them taking action, such as buying a hamburger after seeing a Burger King commercial. It could also be a passive response where the consumer doesn’t take immediate action but has gained brand awareness of your business or its products. When my son was four years old, upon seeing a McDonald’s breakfast biscuit billboard, he called that big board an “appetizer.” Well, he was right in a lot of ways. When I talk to a digital advertising trader, entrenched in running campaigns day in and day out, I get the feeling that advertising is all about frequency and recency. It’s about how often are we hitting our target audience and how quickly we are retargeting them. When I talk with a college about how digital and traditional marketing work together to improve current marketing and recruiting efforts, I refer to these advertising efforts as touchpoints. They’re all part of the same pathway or journey of touchpoints that are leading a prospect down the road towards conversion. However, I’ve come to think about advertising in a different way. I’m starting to view advertising as “rhythm.” As a musician, I can’t stand it when the band I play with is out of rhythm. Being just one beat off or holding a rest too long makes the whole band seem out of whack, not to mention the poor people listening and singing along with us. The same rings true for society. People have rhythm to their lives. You often hear people say, “Well, that person sure does march to the beat of a different drum.” We have rhythm in the way we get up in the morning, our routines, and the streets we drive to get to work. There’s even rhythm to the things we order at the restaurants we frequent and the songs we like and listen to or sing out loud in the car to our kids’ displeasure. There is a flow by which we live and a rhythm by which we walk, and if any of those things go off beat, we know it fast. But if something falls into our rhythm, such as an advertising message that breaks through and is on beat with our life, that’s a connection that sticks. I think that rhythm, the one that we live by, that our customers, consumers, or prospects live by, is a hint to us as marketers. And it comes down to the heart. Our heart has a rhythm. But when it’s out of rhythm, we end up at the doctor’s office, or worse, the hospital. Have you ever looked at a heart or cardiac monitor and listened to the beeps? Have you watched the lull before the spike and then the “beep” sounds? There’s a horizontal path that the heart’s rhythm is depicted by and then there’s a vertical leap, where the heart’s rhythm skyrockets vertically before coming back down into its horizontal lull again. I see that in advertising. I feel that in advertising. What does our advertising need to do to get past just the mind but penetrate the heart, and in doing so cause the mind to think and the person to act and do? There’s a university client I’ve worked with for a couple of years now where I see this rhythm, this journey of the horizontal meeting the vertical. Each year we research and design an integrated media plan for this client to aid in its efforts to expand its geographic footprint and increase application numbers. After researching their target markets and core audiences, we coordinated their campaign to reach prospects at key times in the recruiting cycle. We use strategies such as digital media, Out of Home advertising, and local TV programming and design them to be in step with their ongoing admissions efforts through direct mail, email, and open house events. Already, I’m starting the feel the rhythm here. With different audiences come myriad different heartbeats, each marching to the beat of their own drum, following a different rhythm. Different geographic markets have their own rhythms and kinds of media and messaging to which they will respond. 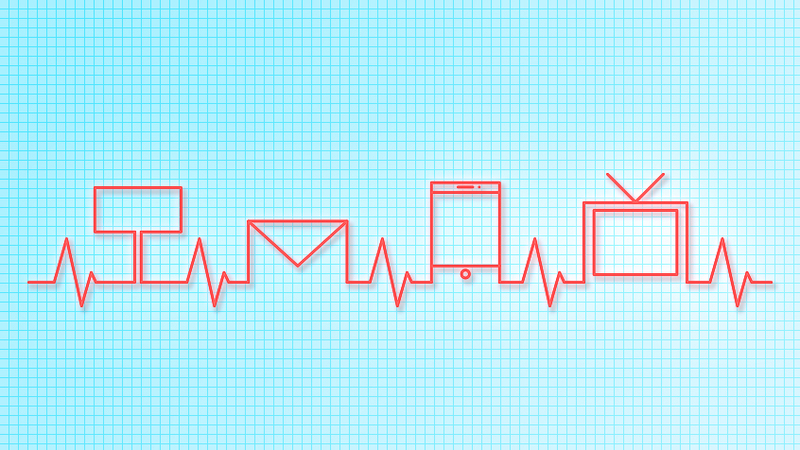 Ebbing and flowing as one steady heartbeat of marketing. You could almost say the integrated media plan with its various channels of traditional and digital media mimics a heart monitor readout. There are undergirding strategies that flow on the horizontal, such as search engine marketing, that are always constant, always consistent, and always waiting to capture someone’s active interest. Then there are vertical spikes, those kinds of media channels that cause the spike in attention and bring the person’s head upwards. When you look at an integrated media campaign, the good ones seem to have a rhythm. You can picture it with me, can’t you? You’re driving down the highway to get to work, your eyes are on the road and that billboard catches your attention. Ah, the vertical spike. The rhythmic jump of the mind and heart. Maybe you’re walking in the mall and you pass a store you didn’t know you even passed and your phone “dings” at you. You take your eyes off Auntie Anne’s pretzels—horizontal— and you look down at your phone to realize you’ve been proximity targeted by the Banana Republic you passed with a 20% off coupon—vertical. Rhythm’s origin comes from the Greek rhythmos, or flow, and is also closely related to the word rhyme. There is a rhyme and rhythm to the way people live, therefore there should be a rhyme and rhythm to how advertising can also work within and around our customers’ lives. If you can understand and learn your prospect’s rhythm, you will find the pulse of your audience. You can identify the opportunities to connect with them in a more meaningful and impactful way and, in doing so, you will get to the core of advertising – the heart. Let us help you find your rhythm! Learn more about Seventh Point’s Higher Education work at www.seventhpoint.com/highered, or contact the EMC Outdoor team using the form below. Jeremy Fern is a guest contributor on the EMC Outdoor blog. Jeremy is a recognized higher education admissions consultant, a keynote speaker, and a blogger with over 15,000 regular followers. 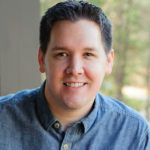 He has held marketing and admissions positions at Gardner-Webb University for nearly 15 years before signing on as Seventh Point’s Higher Education Specialist. Visit www.seventhpoint.com/highered to find out more about Jeremy and Seventh Point.